It basically all started when i was getting sick of fishing the same spots all the time and I thought I'll suss out a new body of water. One afternoon I decided to head down to a spot that I have driven past hundreds of times before but never thought to fish it. I flicked a variety of soft plastics that afternoon and ended the session with absolutely nothing, but was convinced that it held decent fish. 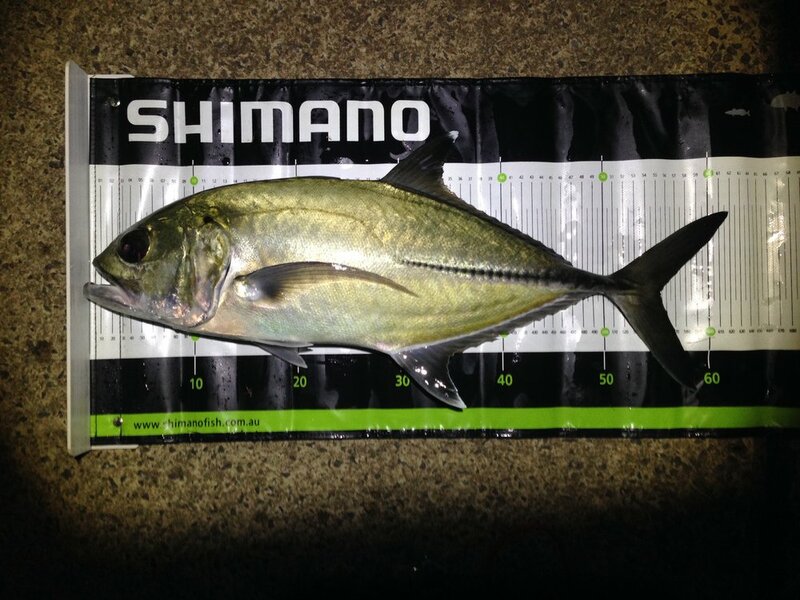 Over the next couple of months I fished it regularly with both lures and dead bait with moderate success, only managing to land a few bigeye trevally and the odd mosses perch, cod and bream. During this time I had spoken to a few of the local fishos that had informed me of some recent sightings of massive giant trevally cruising the waterway. One day the tides where perfect and instead of flicking the usual soft plastics I thought I'll give it a go with some livies. As it was getting to the peak of the tide my livey got smashed and I was on! 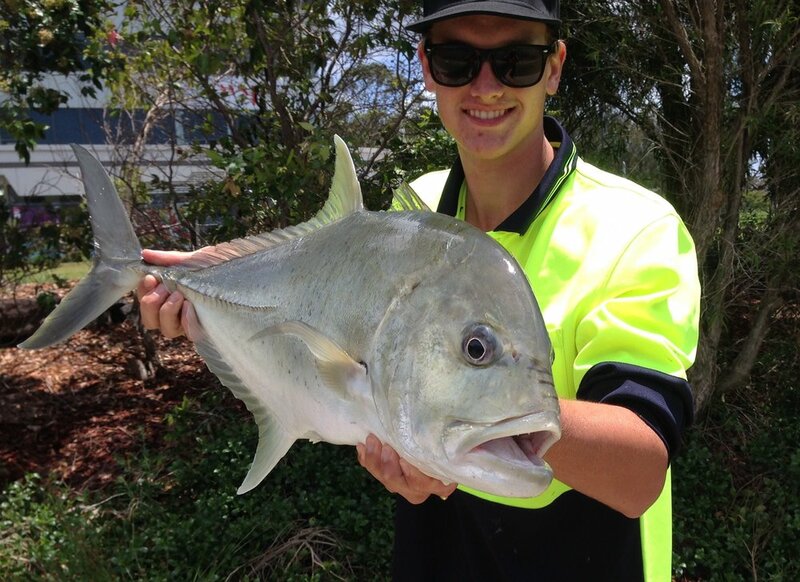 After a 5 minute battle on 30lb line I managed to land a 75 cm giant trevally and was stocked! After a few photos and the release I cast a fresh livey out and got instantly smashed again and landed another 75cm GT and pulled the hook on another two. After nearly getting smoked that day multiple times on 30lb gear I thought if I am ever to stand a chance on one of these alleged 1m+ gt that have been sighted here, then I better upgrade my gear. I upgraded to a 5-10kg shimano raider running an 8000 size shimano baitrunner OC spooled with 50lb braid and 60lb leader which I thought would be perfect for live baiting. Exactly four months had past and I hadn't landed a single gt since! Finally.. This day the tide was perfect again, I was fishing the regular live bait setup and was just about ready to pack it in and leave, I had dumped all my livies out and had the one livey left on the end of my line. I happened to look up to see where my livie was and then I saw it! Not even 2 meters in front of me was a massive 1m+ gt making its way along the shore line. I wound my livey in quicker then I ever had before and cast it directly in front of where the gt was heading. At this point it had disappeared, 20 seconds had past and I thought there was no chance of it happening. And then Boom! A massive bust up right on my live mullet. I knew it had to be it. The drag was screaming and it would of dumped half the spool in one run. At this point I cranked the drag up and was slowly able to work it in. After a solid 5-10minute battle it was in the net and I could breathe easy. 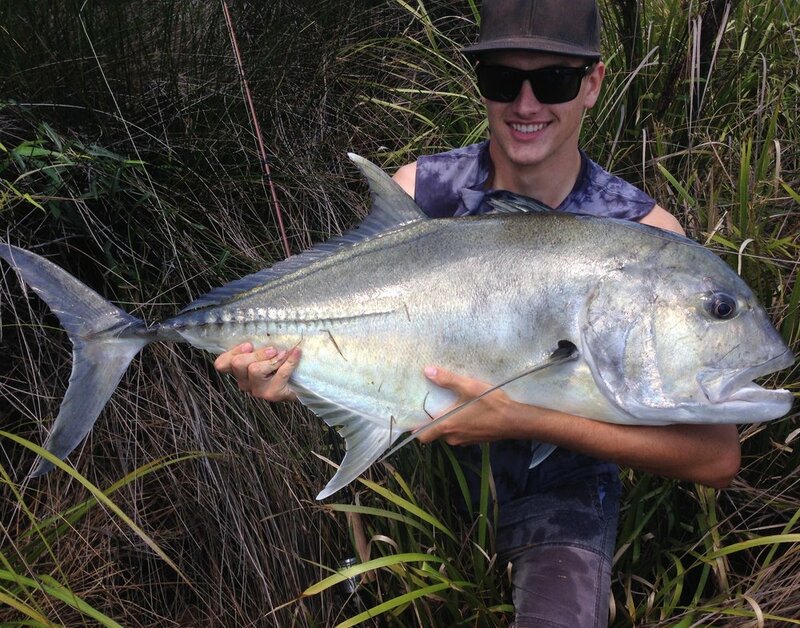 I worked quickly with the help of a few other legends that happen to be fishing near me to photograph, tag and release the big fella back into the canal in which it came from. I am still frothing from the experience and have unfinished business with the two other monster gees that I saw following behind its mate.